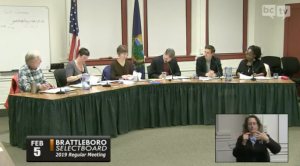 The Brattleboro Selectboard helped Groundworks take a step forward with a shelter/campus project. Their approval came after a passionate plea by a next door neighbor to preserve the building. The meeting seemed a bit like an enjoyable poetry reading at times, with ideas and words flowing back and forth. Everyone caught the groove, and they wrapped up with lots of time to settle in for the State off the Union address. Ready for another selectboard meeting? I’m ready to go…. Peter Elwell – an emergency situation on Main Street. A water break that may be in a sprinkler line. It’s not under the road. It’s under the sidewalk, at Penelope Wurr and bike shop building. The good news is that power doesn’t need to be shut down, at least for now. The area is secured and utilities crew on the scene. Work will continue all night. Water has been shut down along Main from Elliot to Grove. Significant. The Brooks House water is fed from High Street, not Main, so they may get water back. Everyone impacted overnight in the 2 block radius. Firefighters going door to door to advise those affected. Dispatch has been calling business owners, too. Kate – avoid going down there if you can. Shanta Lee Gander – a panel on Business and Compassion in April, part of a series at the library. More info coming. Gershan Moore – this past weekend, again, another violent event – a girl was pistol-whipped. Is anything being done to get rid of this. It can’t be hidden any more. Something needs to be done fast. Elwell – the police released info asking the public for info. Police are solidly on top of situation, but not necessarily close to making an arrest. Moore – ask businesses on Elliot Street. We see it all the time. Ricki – running for D2 representative. Hearing about water line break. Is that affecting people’s water? Elwell – people will need to boil water for a while when it comes on. Town is responsible for testing system. Ricki – any consideration for helping people testing water for people earning under $35,000? Elwell – not sow, but SB could consider it. Ricki – when will you consider it? During this emergency? Elwell – if Town was to offer that, it should be a town policy about the water system. Decision not made in response to a particular incident. Ricki – well, when will it be addressed? This could happen again. Kate – at a future meeting. Ricki – only if you want to? Tim Wessel – if you want us to, too. Elwell – Town test water, but we don’t have a program to test water at private sources. Ricki – can you commit to doing a better job on that? Kate – It’s one of those things that it is a concern of yours. Ricki – aren’t you setting agenda items? Will it be on the list? Rick – but will it? Kate – The Town Manager will take this up. Ben – a friend who lives in Greenfield has their own ISP and why doesn’t Brattleboro? We’re a perfect community to have our own provider. I bring it up again. Elwell – there’s a list of ideas that are wishful, and others that are to-do, and this one is crossing over to the to-do list. We’ve been preoccupied with parking changes, so in next few months we can give more info and can discuss what municipal broadband might look like. It’s complicated, there are advantages and disadvantages. WE’ll have more info in coming months. Ben – it is a priority issue. Internet access has a high price. A town provider can help offset connections for students and this with less money. David Schoales – schools have fiber. Academy school is the hub. Also, we committed to look at a sustainability coordinator, and that would be a part of it. There speed of internet access. Kate – we’re continuing the discussion to hear the Co-op and get staff recommendations. Staff wants overflow parking in Preston Lot, 2 hour meters on Frost Street, and pay and display kiosks at Elm St lot and raise rates plus reduce permitted spots to 20 from 40. The Co-op purchase permits and the rate is about to double, so they ask that they are grandfathered in to pay current price. Moreland – that’s still our recommendation. Looking at Co-op issue we could NOT reduce the number of permits, or we could stop at the parking changes at Frost St and don’t touch Elm Street for a while. Staff believes full implementation is a good plan. Pay & Display with pricing like other lots would be most flexible. It’s still advisable. Co-op has 15 spaces set aside – they own them and not talking about those. Just the lot that the general public can access. Brandie Starr – but prices would still go up? Moreland – from $55 a quarter to $100 a quarter. Everybody’s permit goes up. Elwell – The Co-op spaces inside the lot are purchased just like others; the spaces outside the lot aren’t impacted. They own them as part of consideration for Whetstone Pathway project. Starr – how many permits the Co-op buys? Wessel – total number of spaces? Moreland – a couple more than 40. Kate – so you want to sell 20 permits and have pay and display? Moreland – yes. It’s all pay and display. New businesses in area have parking needs. Trying to adjust system to serve broadest parking needs. Gander – Co-op doesn’t ask for more permit spaces, they want lower prices. Moreland – we don’t recommend that. Kate O’Conner reviews the proposals. They like Preston Lot overflow, and extra spaces on Frost. Gander – when did we do increases last, and what would the extra money be used for. Kate – with new meters in Fall. And 15 yrs before that. Elwell – Parking revenues go to the parking fund, to pay for new meters and for cash flow to repair lots. There is a basic fairness to this, so we don’t recommend the grandfathering. Schoales says they should do all but leave permits capped at 40. Wessel – we could split the difference and make it 30. Elwell says issuing 40 means the risk of a full lot if we have Pay & Display. 20 was more of a balance, so there’s a good chance there’d be a space when you show up. Brandie – I’d be inclined to keep things as they are. Unfair to raise cost so much on Co-op so quickly. No rush to implement the new changes. Oscar Heller – the Co-op’s parking gets used for free and people who don’t shop there. Is there any consideration.. what’s the thought process on this. It’s a real argument for giving them a break on this. Schoales – Having it the same for all is fair for all. They use employees to watch the parking lot. Gander – I agree with Brandie to give them some space to adjust. Thy discuss moving the implementation date. Brandie says it doesn’t help. Let’s look at actual usage. Gander agrees. Tim – what about my compromise? They vote on it – the cap of 30. 2-3- it fails. They vote on it – as-is it is! 5-0. Kate – Long Falls Paperboard – not ready. BDCC needs to do more work before the application can be submitted. So, Groundworks gets to apply. They tell the board about the organization and the project. Board president is joined by business manager and another. Groundworks is planning on building a permanent home for seasonal overflow sheltering, day shelters, drop in center, and administrative and program offices. Rhianna – we were asked to preserve and maintain the existing building, and will replace the one we buy. Current space is just not doing it. Want to better serve. Our long term goal is to put ourselves out of business. This will the organization help by having all staff in one place. It’s a cost savings to support people and not have people living on the streets. The $3.1 million project will be located at 54-60 South Main Street. They’ll demolish the existing structure and do new construction. Biz manager explains the budget and grants. This project is about streamlining. Funding comes from a variety of sources – private funds, a capital campaign, foundation grants, Efficiency Vermont, and the Vermont Housing and Conservation Board. O’Connor explains the grants, and how it isn’t tax money. It’s government grants, and loan repayments. Good money for a good cause. Brattleboro will help out by helping with a $500,000 grant application to the Vermont Community Development Program, and by granting $50,000 toward the project from Program Income. The seasonal overflow shelter has sheltered over 30 individuals each night since November. Need is going daily. They’ve outgrown their space. Looking at the few properties available in Brattleboro, purchasing the adjacent space makes most sense. “I’m for it,” says Brandie. Schoales notes the increase in demand and homelessness on an upward trend. How long will this hold you if the trend continues? Schools have been considering on to buildings to help deliver necessary services. Rhianna – overall demand across all programs is up, from case management to shelter beds. Schoales – will this be a zero-carbon building? Board prez says they’ll do their best. If it is in the budget we’ll do it. Trying to be cost effective. Want to reduce cost of running the building. Schoales – program management is 1/3 of construction costs? What is that? Moreland – that’s a term for architecture, engineering, business reserves… so to stay healthy they’ll reserve certain funds to account for business interruption. Biz manager – yea – they want projects to be sustainable, so they look to us to pre-fund some of our reserves. They want to see us get off on the right foot. Hope is to start construction by end of summer. Tim – I support this, but want to check on our program income. It’s public money we’re overseeing, and where does it stand? Elwell – about $700k right now. $50k is a good investment. GS Precision just made a big payment into the fund. Tim – you already have 1/4 of private donations pledged? Board President – yes – $400k+. It’s a very generous community we live in. Elizabeth Howes, live on south main street. This is between the drop in center and my home. That house is an antique, and has a ties to those bringing cloth into the community. It goes back tot he 1820’s. It hasn’t been dusted off. I don’t know how to bring up a freshening up. It’s 200 years of a promise of a place to stay to display cloth. I feel sentimental about it. I have a feeling about this whole valley as being and old cornfield for dairy field, and that’s a connection to these houses. This project could come up Putney Road before the roundabout, below the Community College. That space has been open and asking for a commitment. That’s an ideal direction for such a large project. People are drawn to the community out of heritage or history and try to reason why we’re here, in a non-money economy. It’s not stated right now. Milk the sheep or whatever. Could have a donut shaped building with an atrium glass ceiling and you could be available for free labor, but that’s un-American. It’s where our lost consciousness is. Why am I at the drop in center? How do I move beyond? Linens, cotton, and organic market. It’s like looking for free housing. For those not part of the moneyed economy, you are ready to work. A housing unit like that would be a good place for our money to establish a commitment. The Sportsman’s Lounge is to house the cowboys when they come into town. There’s a place for them.It’s important to have a place because you want to work. We have a responsibility to be very frugal about energy. The house between us is a precious old dusty thing and we need to keep that. Biz guy – it’s 1790 – we did a historic review of the building. Too expensive to restore and it would make cost prohibitive. State agreed that we can preserve one building and demolish the other, and will make sure it fits with neighborhood. We’ll recycle some slate. Trying to acknowledged. Elizabeth – the design in the Commons looks like a larger version of the pro in center next door. It’s designed like that to house the whole idea of the overflow, winter shelter,… you can’t wreck that house. Let go of the idea of changing that neighborhood and take on the idea of putting together all of these transient persons who feel drawn to the area who are rejected for whatever reason, this collection of persons is moved forward to belong to a new piece of architecture, for Wilmington, for people who come to ski. Space on Putney Rd would be better. Bis guy – we looked at sites all over Brattleboro. It is hard to site our programs in town. Want to be as close to downtown as possible. Board Prez – we looked at saving the building – historical and engineering. It’s not structurally sound. The facade looks ok, but the inside is too far gone. It’ll be hard when it comes down. Elizabeth – it will not come down. It is my natural poetry. You live where you live and I’ve been living there. I can’t let go of the motherhouse. It’s an antique. Don’t touch my antique. You have to respect that. To tear up the old homes… it is not something you built or planted. The project looks good, but it should be somewhere else. Roberta Crispino – I just arrived here and find the community welcoming. I taught in Waterbury CT for 40 years. If public education system is to produce morally sound lifelong learners, if Groundworks can be educational, then they have the same role. I moved here with no place to go and little money. As a transgender woman it is tough. I’ll go back to CT. There is beauty in everything. The best thing I gave to my 3 children is roots and wings. Kids to need to have a solid foundation of who came before them. Millenials don’t care about anything. I ended up in Groundworks shelter. I take a shower. You sign up on a board and ask if anyone has to use the bathroom. I’ve met wonderful people there. I learn from every experience I find myself in. Where you live, is it a house, or a home. Home is where the heart is. If majority of Groundworks serves Brattleboro, explore the roots of this community. This is an arts community. I surrender to my creativity. As a teacher you inspire and give people hope. That’s all I’ve ever done. I give of myself, I came here, and people gave to me. I met a stranger. I met Elizabeth. I said can I be your friend? I came out 2.5 years ago. The least among us in Waterbury accepted me. I’ve looked at abandoned houses. It should be a crime to tear it down. Libby Bennett – we have a plan to document his building for historical purposes, too. Ricki – I may not understand or agree with comments, but appreciate and value so much of what they have to say, over parking and driving and cars by the Selectboard every week. David mentioned a concern about 1/3 going to salaries – there’s no shame in paying people for this work. We should not be profiting off of other people’s misfortune. Investing in people will improve the economy. Gander makes motion to apply for the grant, and so on. It’s approved! Kate – Vermont Community Development Grant for $425,000 to construct 22 apartments at the former Lamplighter Motel. Just need to close this out. Elwell – yup, that’s the report. Project completed and services in place. A success! Starr – wonderful project for community. Kate – it’s been 4 years in June. Here to take action on contract. New contract through 2024, pay is $102,804, plus percentage wage increases equal to the non-union employees, plus $5,000 for an automobile allowance. The contract allows for additional travel expenses to be reimbursed. There are also the standard employee benefits. He gets six weeks of vacation leave a year. He gets four months written notice if the Town wants to terminate the contract, and must give four months notice if he wants to resign. Shanta – I just want to say thank you. You have more than a handful and it has been an honor working with you. Ricki – early voting is on Feb 13 so residents can vote. I am hoping to cohost a forum so at least all D2 people introduce each other and try to get BCTV to film it.